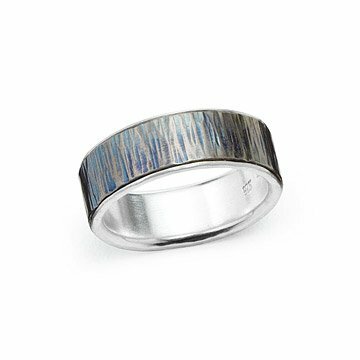 This handmade titanium and silver ring is accented with a band of wood grain pattern. Love can grow stronger with every passing year. Like a great tree, its roots push deeper, its arms reach wider, and it grows strong enough to weather any storm. You can carry that symbolism with you alway with this earthy, faux bois titanium wedding band. This handcrafted wedding ring from metal artist Tavia Brown has a core of sterling silver, wrapped in a band of titanium. The titanium band has a rippling texture that evokes the organic texture of tree bark. The artist then uses a torch to give the titanium a rich, bronze-like "heat patina." Brown loves to embrace contradictions in her work. Titanium is an extraordinarily durable metal, highly resistant to corrosion, but it can also be delicate—it is extremely lightweight, and nonallergenic with human skin. It takes great care and craftsmanship to sculpt these metals, and yet the wood grain evokes the simplicity and innocence of the natural world. And while you may not be able to carve your initials into this wood, by wearing it you show token that someone's initials are engraved deeply on your heart. Handmade in Charlottesville, Virginia. Visit our blog to learn more about Tavia Brown and her titanium wedding bands. Tavia began studying arts and crafts as a young child. Throughout her education she developed her love and talent of making small-scale, three-dimensional forms. While continuing her artistic studies in college, she discovered her love of jewelry and graduated with a Bachelor of Fine Arts with a Metals concentration in 1998 from Appalachian State University. Tavia's work has developed along with the changes in her career and family. Married to an entrepreneur, and now a mother of two, she is constantly working to keep her business a perfect match for her and her family. Sharing studio space with other metalsmiths and artists, Tavia thoroughly enjoys being at her studio creating her one-of-a-kind and limited edition jewelry. Working closely with clients, she also loves designing custom jewelry - engagement rings, wedding bands, memorial objects, and more - creating the perfect item. Inspired by the dichotomies in life, by memory, by texture and by nature, Tavia designs and creates each piece of jewelry using various techniques, including lost wax casting, cold and hot fabrication, die-forming, etching, raising, and stone-setting. Expressing her style of elegance with an edge, Tavia's jewelry continues to enhance and refine as she grows through life. Sizes 5-11, including half sizes; Ring approximately .28" W x .88" dia. Clean with a damp cloth or with mild detergent and a soft brush. Avoid tarnishing by keeping in an airtight jewelry box when not in use. You may also take it to your local jeweler for tumbling to brighten it up. Sizes 5-11 available, including 1/2 sizes. Due to its handmade nature, Please allow for some variations. This ring made by Tavia is PERFECT. When my fiance first showed it to me, I was really hesitant about ordering something online with no guarantees of how it would look and fit upon arrival, but uncommongoods was able to connect me to the artist and she was SO helpful and exchanged so many emails with me to make sure we got exactly what we wanted. The ring fits perfectly and is absolutely beautiful. We love it! Had a jeweler size my husbands ring finger and ordered that size. However, because the band is thick it runs a small and is to tight for his finger :( makes me sad its a wonderful ring he can't wear.